With Burning Bridge, composer/violinist Jason Kao Hwang sets the boundaries of aesthetic sensibilities, cultural assumptions, and his personal history ablaze. 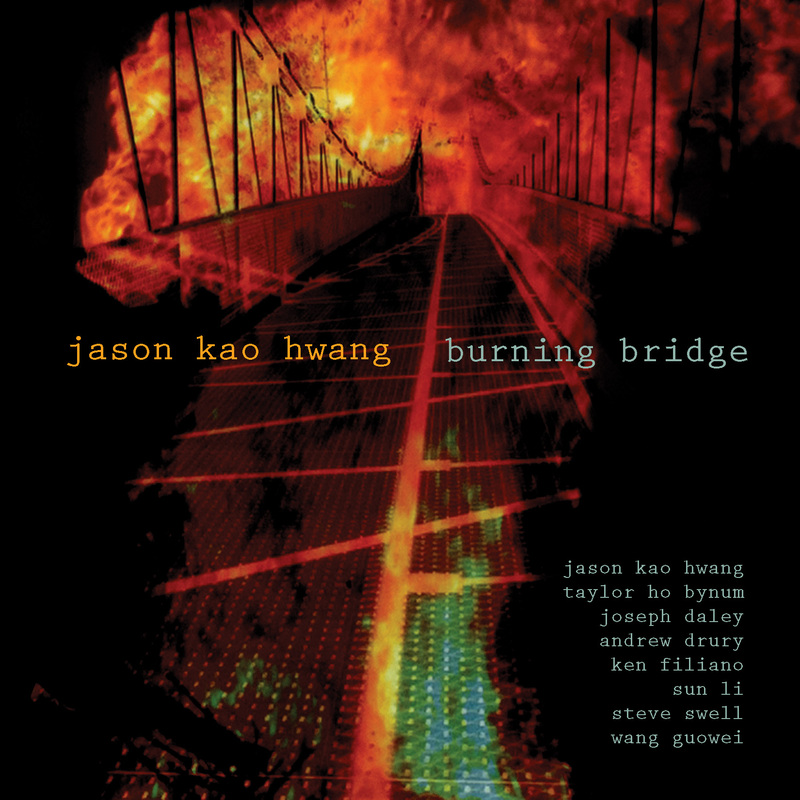 His second CD for innova Recordings, Burning Bridge is a meta-language that is both the vehicle and essence of his music and features members of his quartet EDGE (Taylor Ho Bynum, Andrew Drury, and Ken Filiano) with the addition of Joseph Daley, Sun Li, Steve Swell and Wang Guowei. Hwang burns the bridges between the traditional roles of the ensembles instrumentation—whether jazz, classical, or traditional Chinese—to forge a single musical voice that resonates with distinct cultural overtones. The poetic complexities inherent in this sound means that the music creates a totality, a mingling of all the attributes of a human being. Burning Bridge transcends representation to become experience. The macro conditions set by this jazz composition will cultivate many micro discoveries of sound and phrase. Both differences and commonalities between jazz and traditional Chinese musicians will be embraced. Initially, the novelty of Chinese sounds will appear dominant to the listener: in the plucked unison between the pipa and string bass, the pipa will stand out. But as the listener becomes enveloped in the music, spectacle sensations diminish to a sotto voce, and a democracy of sounds emerge and flourish within a vibrant dialogue. Burning Bridge utilizes the emotional territories produced by the process of notation and improvisation. Each modality possesses an energy that can be either blurred into a single flow or made distinct. The interplay of modalities offers a compositional dynamic between the jazz musician’s personal voice and the over-arching narrative. With bridges afire, the infinite permutations between improvisation and notation, between the individual and collective, are architecturally sequenced to conjure a narrative landscape through which the listener will journey imaginatively. Though the sonic physiology is complex, the actual living music is experienced simply. In 2009, Mr. Hwang’s mother passed away and his reflections upon her life flowed into the music. The opening motif was based upon her speech patterns for a Chinese proverb she had repeated to him many times during his childhood. Another motif is based upon his memory of a Presbyterian hymn they sang, “Doxology.” He even reached back to his very first band to incorporate a work (“Ocean”) from the early ‘80s into the fifth and concluding movement of Burning Bridge. Burning Bridge, composed upon a Burning Bridge, consumes temporal illusions while enveloping the concurrence of life and death. Here the tinder of history and culture feed flames that vibrate within the core of both instinct and identity. The fire, often ignored, has always existed, with bridges burning each moment of our ever-changing lives. Jason Kao Hwang (composer, violin/viola) has created works ranging from jazz, “new” and world music. The 2012 Downbeats Critics’ Poll voted him “Rising Star for Violin.” In 2011, Mr. Hwang released Symphony of Souls, performed by his string orchestra Spontaneous River, and Crossroads Unseen, the third CD of his quartet EDGE. EDGE also toured Poland and the critics’ poll of El Intruso voted Mr. Hwang #1 for Violin/Viola. In 2010, All About Jazz/NY selected Commitment, The Complete Recordings, 1981-1983, a collective quartet that was Mr. Hwang’s first band, as one of the “Reissued Recordings of the Year.” In 2008, Coda Magazine named Stories Before Within, released by Innova and the second CD of his quartet EDGE, as one of the Top Ten CDs of the Year. Mr. Hwang has received support from US Artists International, Meet the Composer, the NEA, and others. As violinist, Mr. Hwang has worked with Reggie Workman, Pauline Oliveros, William Parker, Anthony Braxton, Henry Threadgill, Adam Rudolph, Butch Morris and many others. "[A] multifaceted and wholly absorbing reflection on [Hwang's] mother's life; the music draws on both Chinese and Western musical styles." "Hwang stands at the crossroads of his influences—classical, jazz and traditional Chinese music—and sets the divisions between them ablaze. ... The resulting palette is expansive, and Hwang explores its full range."